Hi, I am Mr. Land Trust and I have been a full time real estate investor since 1969. I want to teach you how to create your own Land Trusts and other Privacy/Asset Protection techniques. To be clear, I am not talking about land conservation land trusts, but Trusts that hold title to your investment real estate. There is a lot of wealth to be made in real estate investing, but you have to learn how to protect it or you will lose it! It is actually easier to build wealth than it is to KEEP wealth. Once you reach a certain level of success everyone (and their dog and their dog's attorney) will be after you for a free ride. Filings of civil cases in the district courts continue to increase. 2015 cases jumped to 375,870 according to the latest government data. Despite our "innocent until proven guilty" system, you can be 100% innocent and still be sued to the edge of bankruptcy for frivolous reasons! You spend a lot of time learning how to make money in the real estate investment business. Please take a few minutes to learn how to protect those hard earned assets. I will give you a Real Estate Trust example a little later. I actually heard a lawyer say this once, "We attorneys survive, it is the clients who come and go." Yes, I use Limited Liability Companies too, but NOT to hold title to real estate. Think about it, didn't grandma teach us to "not put all your eggs in one basket?" That is exactly what you are doing if you title more than one property in ANY one entity. Don't do it! What Is the Definition of a Land Trust? What Land Trust Forms Do I Need? Do I provide Trustee Services? What About Irrevocable Land Trusts? I have answered those questions and others in my FAQ section. Please take a few minutes right now to read this information. I promise it will be worth your time.. Remember, Land Trusts are like submarines, they take you below the surface and keep your activities off the public "radar." and YOU can learn to set one up yourself! The general public thinks that all real estate investors are RICH. Therefore, real estate investors are more of a "target" for lawsuits. However, lawyers are not stupid. They know that there is a difference between winning a lawsuit and collecting on a judgment. So, if you own property in your own personal name you appear to be a good candidate for a lawsuit (justified or not). Did you know there are legal sharks swimming around out there ready to attack you and your property and steal it from you? Do you want to stop them? I have the answer for you; Real Estate Land Trusts and asset protection planning. Without a Trust you are hanging your ASSETS in the wind for anyone to come along and sue you right out of owning them. Start the process of protecting yourself quickly and privately from the convenience of your computer. Many advertise charging over $1,000 for services to set up each Trust for you. I give you the tools (and the forms) to do them yourself OVER AND OVER AGAIN AT NO ADDITIONAL CHARGE! I also EDUCATE you about Trusts and exactly how they work. The HOW and WHY. So you can produce as many Land Trusts as you want (I suggest you to put EACH property into its own separate Land Trust to insulate each property from the other). After you understand the basics, I offer you a complete home study course to understand what Land Trusts can do AND I give you all the forms needed to create your own Land Trusts. 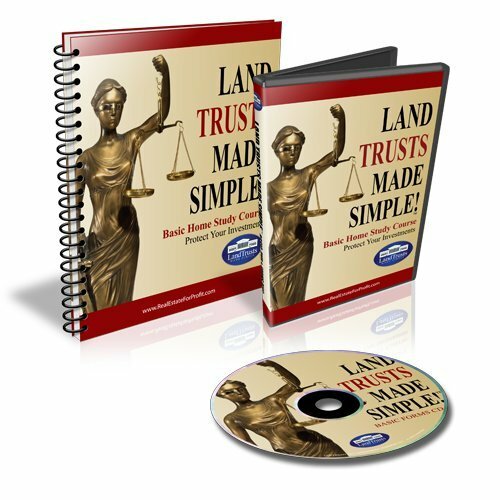 Land Trusts Made Simple Basic Home Study Download (Buy Now) is the most complete guide in the USA today to starting your own land trusts on your computer without paying anyone to create them. If you have one property or ten you would pay from $1,000-$10,000 to setup individual land trusts (Remember, I suggest you always have separate trusts for each property). Included in my Home Study courses are all the forms to create and maintain your Land Trusts at home without paying anyone! Again, this is a must to protect your vehicle to wealth (real estate). For the real estate investor I offer a Basic live seminar every year and an Advanced live seminar every five years. I also offer these two seminars in DVD format for those who cannot attend my live events. I give you the tools needed to start protecting your assets immediately. If you purchase a hard copy or digital version of my Home Study courses, you will receive a DVD of me teaching the material to a live audiance. I have been investing in Single Family Homes (as rental property) since 1969. I have discovered that there are NO positive benefits to owning real estate in your own personal name...only negatives! Learn NOW how to protect your investment real estate from the deadbeats in our society (and their contingency fee lawyers).